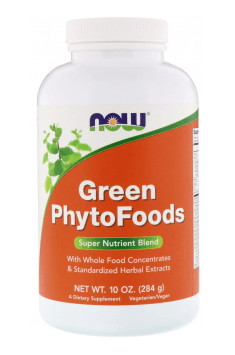 Now Foods Green PhytoFoods is a dietary supplement in powder form. It contains high quality concentrates and standardized extracts from organic vegetables and fruitsthat are natural source of well-absorbed vitamins, minerals, dietary fibre, antioxidants, prebiotics, plant enzymes and many other phytochemicals with health-promoting effects. Intensely green parts of plants are a rich source of chlorophyll, a green dye that allows the photosynthesis activity. Model studies prove the positive effect of chlorophyll. It significantly reduces the risk of developing liver and stomach tumours and at the same time it displays carcinogens. Chemo preventive efficacy was noticed only at large amounts of chlorophyll, difficult to obtain in the average diet.That is why it is worth to use concentrated preparations containing this compound. Chlorophyll has antioxidant activity, normalizes glucose in blood, slows down the aging process, provides magnesium and increases energy and vitality. Fruits, vegetables, seeds and tea contain high amounts of polyphenolic compounds. Polyphenols are compounds including flavonoids (catechins, anthocyanins), phenolic acids and stilbenes. A common feature of the structure of polyphenols is the presence of hydroxyl groups in the molecule. They can reduce free radicals that indicate strong antioxidant activity. Polyphenols have a wide range of pro-health properties. They act anti-inflammatory, anticoagulant, antimicrobialand seal the blood vessels. Their anti-cancer (including inhibiting the formation of mutagenic compounds in the body) and anti-atherosclerotic (by inhibiting atherogenesis)activity has been proven in many statistical and animal studies. They are also anticleric and have protective effects on the liver. Grape seeds (Vitisvinifera) are the main source of resveratrol, a polyphenolic compound that shows antioxidant, anti-inflammatory and antiplatelet activity. Resveratrol supports the cardiovascular system. Thanks to its antioxidant propertiesit inhibits the formation of free radicals in the platelets. Resveratrol is antiatherogenic and cardioprotective. It protects LDL cholesterol from oxidation, so it is an important element in the prevention of cardiovascular disease. It has been demonstrated that Resveratrol activates the SIRT1 protein, and that is why it is called:‘the elixir of immortality’. Dietary fibre supports the digestive tract. Itcan be found in oat bran, bran brown rice, apple fibre, vegetables and fruits. Dietary fibrehelps in constipation and diarrhoea, facilitates the removal of toxins from the digestive tract and provides the feeling of satiety. Fibredemonstrates general health-promoting effects. By delaying the absorption of sugars it stabilizes blood glucose level, lowers cholesterol and triacylglycerol. It is an important diet component in obesity and atherosclerosis. Fructo-oligosaccharides (FOS) are a soluble fraction of dietary fibre, they perform prebiotic functions. In the colon they ferment into compounds that support the development of beneficial bacterial flora, including lactic acid and short-chain fatty acids. It has been proved that FOS supplementation increases the amount of Bifidobacterium in gastrointestinal tract and limits the amount of potentially pathogenic bacteria of the genus Bacteroides or Clostridium. Silymarin is a complex of compounds present in the milk thistle fruits (Sylibummarianum) and present hepatoprotective effect. Silymarin blocks the penetration of toxic compounds into the liver cells interior. By increasing glutathione level and glutathione peroxidase activity, it protects the cells against free oxygen radicals, stabilizes cell membranes and promotes hepatocyte regeneration. Siberian ginseng (Eleutherococcussenticosus), is a plant exhibiting adaptogenic properties that increase the body's resistance to stressors. It also shows immunostimulatory activity and by supporting memory and concentration it improves physical and mental performance. Maca root (Lepidiummeyenii) is classified as aphrodisiac. It contains alkaloids with adaptogenic activity. Thanks to the presence of polyphenols Maca root exhibits antioxidant activity and supports hormonal balance. Natural plant digestive enzymes: acid-stable protease, amylase, lipase, cellulase, lactase, papain and bromelain support digestion processes, protects from sensation of heaviness, indigestion and digestive discomfort. By facilitating effective digestion these enzymes help to reduce food allergy and food intolerance. Now Foods Green PhytoFoods enriches the daily diet with a large portion of fruit and vegetables providing valuable health-promoting compounds. This product is suitable for prophylactic prevention especially for people who care about their health or those leading an intense and stressful life. Now Foods Green PhytoFoods helps in states of weakened immunity, during energy falls, digestive problems and is recommended if a diet is low in fruits and vegetables. Mix or blend 1 level tablespoon into 8 oz. of juice or water. Take 1 to 2 timesdaily. This product is convenient and easy to use. It enriches the diet with fruits and vegetables. It can be mixed with drinks and smoothies constituting an ideal solution for people living on the run or those whose diet is low in fruits and vegetables. Blueberry (Vaccinium myrtillus) - also known as bilberry. The raw production material are the fruits of berries (bilberry - Fructus Myrtylli) and leaves (Folium Myrtylli). Its fruits are a rich source of vitamins: ascorbic acid (vit. C), B vitamins, provitamin D, PP; micronutrients (zinc, phosphorus, magnesium, copper, calcium and iron). They contain from 7 - 15% catechine tannin, myrtillin, organic acids (citric and malic). The leaves contain: anthocyanins, sugars, flavonoids and multi-phenolic acids, essential oil, minerals and trace elements. The most important ingredient of leaves is glucokinin, lowering blood sugar and inositol, supporting the reduction of adipose tissue and influencing the removal of disorders in the digestive system (antidiarrheal). Berries are a powerful antioxidant that supports the immune system. Leaves are used in the extracts improving the functioning of the circulatory system. It is a supplement for strengthening, detoxification and vitaminizing. Oat bran, produced from a hard outer layer the grain during the technological processing of oats. Contains soluble polysaccharide fractions of fibre (beta-glucan), which provides nutrients for the bacteria proliferating in the human intestine. Beta-glucan has a stimulating effect on immunity, lowers cholesterol, reduces the risk of the vascular system and the heart diseases. Slows down the absorption of nutrients, especially fat and induces a feeling of satiety. Oat bran is recommended as a dietary supplementation in fibre, trace elements and vitamins, especially B group. Used prophylactically to prevent the development of atherosclerosis, and hyperlipidemia. Bilberry (Vaccinum myrtillus), is a plant of Polish coniferous forests containing medicinal raw materials: bilberry leaves (Folium Vaccinum myrtillusae) and bilberry fruit (Fructus Vaccinum myrttillusae). Fruits contain considerable amounts of catechine tannins, and anthocyanins, organic acids, carotenoids, pectin and vitamins (A, B2 and C, P), minerals (phosphorus, magnesium, potassium, calcium and iron), have significant nutritional value, and a significant effect on the regulation of the digestive process. Preparations from the leaves of bilberry are diuretic and disinfectant for the urinary tract, stimulate digestion and metabolism, they contain flavonoids, tannins, organic acids, minerals (e.g. manganese), triterpenes. They are used as insulin-mimetics. In addition, fruits have a disinfecting effect, antihemorrhagical, prevent the growth of worms. Carotenoids enhance vision, especially during the night and have anti-toxic potential, binding toxins in the gastrointestinal tract and excreting out of the body.